The Tower Studio is dramatically situated on a stretch of rocky coastline in Shoal Bay, Fogo Island, Newfoundland. 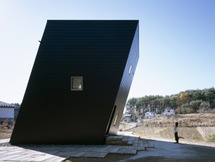 The studio’s sculptural silhouette leans both forward and backward as it twists upward. For the average visitor to the island, this windowless black tower, more often than not, provokes a quizzical response and the enviable question, “What’s that?” For the locals, they know that this structure is a project of the Fogo Island Arts Corporation – an art studio opened in June 2011. The Tower Studio’s official opening was one of the most festive and included: a roaring bonfire, flares dra- matically shot from its rooftop terrace and the recorded sounds of local whales as a background score. Perched on a rocky stretch of shoreline, there are no roads to the Tower Studio, it can only be reached by hiking along the shore from the adjacent community or walking on a narrow wooden boardwalk consisting of weathered planks that hover just slightly above a bog that features an abundance of cloudberries, known locally as bake apples. From a distance the wooden boardwalk reads like a tether strap, linking the stranded Tower Studio to the lifeline of a busy stretch of road. The boardwalk, a mere twelve inches wide, is a vital component to the story of the Tower Studio, it provided an even track for wheel barrows to bring building supplies to the construction site without disturbing the delicate eco-system of the Newfoundland bog and the lichens that grow on outcroppings of rock. The boardwalk is a testimony to the holistic thinking that is part of the Shorefast Foundation mindset that connects the dots of economic, cultural and ecological sustainability at both the macro and the micro level. Now that its purpose has past, the boardwalk will soon disappear in order to minimize the impact on the surrounding landscape of the Tower Studio’s construction. As one approaches the studio, its south-facing entry area is angled back thirty degrees. Overhead a triangulated section of wall leans forward to shelter the double glass doors below. Both the soffit and the angled entryway, clad in hori- zontal boards of spruce are stained white in sharp contrast to remainder of the building’s windowless exterior of vertical plank siding painted slate black. The Tower Studio is comprised of three levels with an overall height of thirtytwo feet. Its entry area is equipped with a kitchenette, a compost toilet and wood- burning fireplace. Its second level is a studio, day lit by a generous skylight that faces northward. A mezzanine overhead, juts into the double height volume of the studio. Aside from the geometric complexity of the space, the second feature that adds to a sense of disorientation is the elimination of architectural detail and the fact that all vertical, horizontal and inclined surfaces, clad in smooth plywood, are painted a brilliant white. The only relief from the stark interior is a sliver of the exterior visible through the studio’s sole skylight. A slightly angled wall opposite and parallel to the skylight provides the perfect viewing surface upon which a body can recline and enjoy the view. One can imagine the magical effect of resting against this surface during a moonlit evening with the audible roar of the North Atlantic and force of the wind against the exposed surface of the tower. From the studio level, a narrow ladder (also painted white) leads past the mezzanine level to the underside of a roof hatch. As one passes through the horizontal opening and stands on the roof- top deck, the view of the ocean and the rocky wind-swept terrain is spectacular. 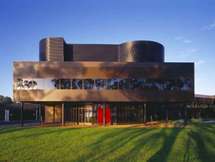 From the roster of studios recently completed, it is generally agreed that the building of the Tower Studio by the local crew of carpenters was one of the most challenging. Although the basic premise of the Tower’s geometry is a simple one – the plan rotates one hundred and eighty degrees to the roof plan – the construction of the facetted form proved to be a little more complex. In order to figure out the framing diagram, a series of wooden models were constructed. Ultimately a large-scale model was fabricated to minimize any on-site confusion. The story of the Tower Studio is not complete without referencing two structures that support it. The first one is a ‘standalone’ array of solar panels situated about fifty feet to the west of the studio’s main entrance. Because all the studios are located on isolated sites without access to the utilities of electricity, water and sewer, they are equipped with photovoltaic panels, compost toilets and water cisterns. The other structure necessary for the Tower Studio’s success is its ‘fraternal twin’ – a restored traditional house in the nearby village where the artist lives while he/she is not working in the studio. All the Fogo Island studios follow the same model in which the studio is paired with a Saltbox – a traditional Newfound- land house, where the artist abides when not fixated on his/her most recent art project. The restoration of the traditional Saltbox house and the new construction of the architecturally provocative studios has created an interesting dynamic that brings the local vernacular architecture face-to-face with the multi-faceted expressions of contemporary culture. As the architect, Todd Saunders, has explained, the fact that the renovated houses were part of a vernacular way of building increased the level of architectural experimentation allotted to the studios. In contrast to the renovated houses, located in the middle of the villages, the studios are situated about a fifteen-minute walk on the villages’ periphery. The artists experience both the warm hospitality of their neighbours, as well as, the cool refuge of their studios. Because the studios are outside the local villages, their architectural character is both seemingly familiar and uncannily ‘strange’. In some sense the studios ‘fit in’, but more importantly they stand out. At times, the stark abstract forms of the studios painted black and/or white seem to disappear into the foggy weather, typical on Fogo Island. Disappearance may be an interesting addition to the lexicon of Saunders’s architectural production that focuses on playful geometries that generate dynamic forms that are strangely familiar. This series of architectural projects on Fogo Island does encompass the vernacular within the production of the new. More importantly, it forms a contemporary sensibility that is vital to reframe, resituate and rejuvenate any traditional culture, in order for it to meet the opportunities and challenges of the twenty-first century – head on.